For Easter dinner I cooked for the family and decided to go with a Brunch Theme. 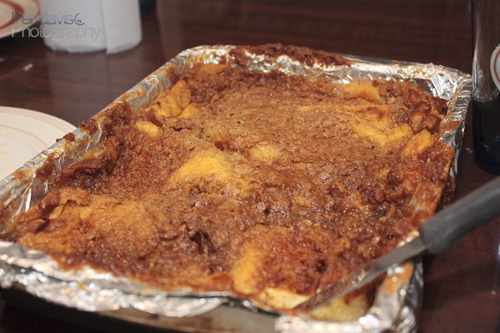 One of the main dishes that went over very well was the Baked French Toast Casserole. It was pretty easy to make, although I made several changes to the recipe. Everyone that tried it loved it so I would have to say it was a success for my first time trying it. Unfortunately I forgot to take many pictures of the process, so I have little to offer in the way of how it developed. I can say that I substituted Challah bread for the french bread that the recipe called for. Challah bread is a special braided bread eaten by people of Jewish faith on holidays. My local Biggs in Hyde Park sells it and I saw a guy use it to make french toast on Food Network once. I myself used it when I attempted to make a version of Vitor's unforgettable French Toast to great success so I swore I would always go with Challah when making French Toast. I started the recipe the night before the brunch by mixing the ingredients in a bowl and pouring it over thick slices of the Challah bread. I let the bread sit out for several hours to give it a firmness. one recipe I read called for day old bread but I forgot to buy the bread a day early and worked with what I had. I wasn't sure how to fit all the slices of bread into the pan they specified so I had two layers of bread and whatever I had left I cut into chunks and wedged it into any open spaces. I also added a bit of orange zest to the custard because it is something I started adding to my French Toast batter as well. I followed my grandmother's method of mixing portions, and I by that I mean I didn't measure any of the spices and dropped them in based on my visual assessment. I was a little heavy on the Vanilla because I am a fan of that flavor. I also added a dash of warm honey to the custard because I saw that in a cookbook somewhere and thought it was a good idea. I am not a very precise cook, which means often have difficulty replicating my magic, but part of the allure for me is the experimentation. I also used 2% milk, as that is what I usually buy, but in my regular French Toast I often use heavy cream. For the Praline topping I made the most changes. My wife can't eat Pecans so I had to substitute. At first I tried a mix of frosted flakes and cinnamon toast crunch because I had that on hand and I have used that as a french toast topping before. Unfortunately those ingredients turned to powder in mixing bowl. I added crunch up graham cracker to the mix to give it a texture, but it wasn't my first choice. It occurred to me later that I could have used oats, which is a topping my mother puts on sweet potato casserole now that my wife eats with us, but at the time I was making the dish we did not have any on hand. The dish sits in the fridge overnight and then I transported it to my mothers where we were having brunch. I threw it in the oven for 40 minutes at 350 degrees. I didn't make any changes to that part of the recipe. My mother has a pretty awesome oven so there were no issues there. The dish puffed up in the oven and came out a golden brown color. Overall I give this dish a 4.5 out of 5 broken eggs. The dish was good, but the recipe called for nuts and that would most certainly kill my wife so I had to substitute, which I should have been more prepared for. Other than that it was delicious and I am definitely making it again. Everyone really loved it and my sister's boyfriend even went back for seconds. The dish tasted kind of fluffy and eggy. Most people did not add the syrup like the recipe called for. Because of the frosted flakes in the topping it was pretty sweet on its own. I added the syrup and it made it taste even better to me. I think of this as a great dish when you have friends and family over and want French Toast but don't want to sit over a stove and cook individual slices. 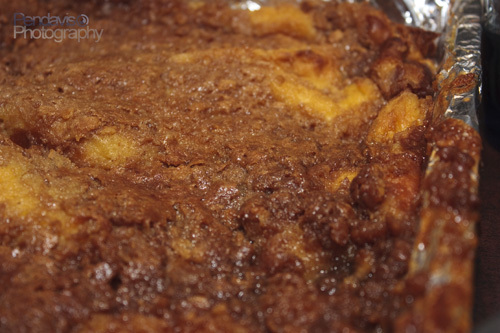 It actually tastes more like a French Toasty Bread Pudding, but I also love that dish as well.